transparency in Abia. He also saw the recently held General Elections as an opportunity to effect leadership change. to Senator Theodore Orji, former governnor of the State and alleged godfather of the incumbent governor Okezie Ikpeazu. I am on this mission to galvanize the youths of Abia State towards a new Abia where they will not be this satisfied with crumbs. A new Abia where they will not kowtow to the masterminds of their sufferings. A new Abia where they will not choose charisma over character in deciding their leaders. A new Abia where they will see themselves as leaders instead of political thugs and servants. A new Abia where they will see our public office holders as servants not masters. A new Abia where they will hold public office holders accountable to the society. 1. Is Abia of today our dream State? 2. Why have we remained stagnant under the PDP leadership for 20-years? 3. What does the future holds for us, our children and generation unborn under the PDP? 4. What are the pedigrees and records of the individuals who are seeking for our votes? The thrust of Norman's write ups amongst others includes the fact that Abia Governor Okezie Ikpeazu had accumulated the debt of N104 billion for Abia State. "It will take us 210-years to offset this debt. They have stolen our future and that of our 10th generations, even that of our children that will be born in 2119 to 2219", he stated. He was vehement, that Ikpeazu and his former boss, Sen. Orji should not be re-elected. And he left no stone unturned to pass his message across. Beyond writing and publishing in his online newspaper, The Realm News, he was also active on the social media. He appeared in several radio and television talkshow, simply repeating his message for a new order in Abia. The climax of his campaign was a protest march which held successfully on Thursday 21, February 2019 despite several challenges and attempts to stop it. 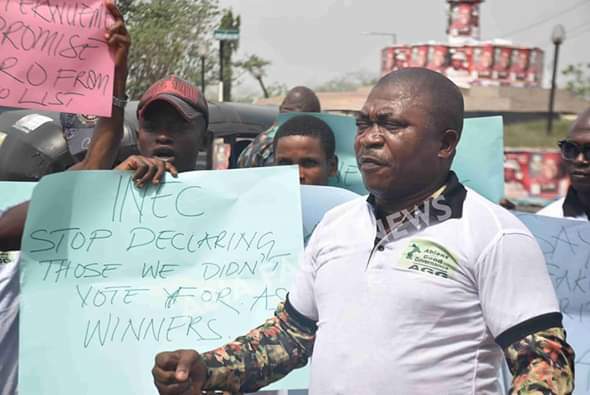 Though the Abia Police Headquarters in Umuahia and the Commissioner of Police alongside the DCP and the ACP Ops persuaded him to cancel the protest, he insisted that the protest will go ahead even if they refused to provide police protection. "My insistence was because of the obvious need to build confidence in our youths, give them sense of belonging, liberate them from servitude and ensure they rise up to the challenges of democracy and elitism", he explained.